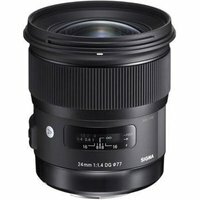 The Sigma 24mm f1.4 DG HSM Art lens is a wide-angle prime ideal for travel, landscape, wedding, architecture, lowlight and event photography. Designed for full-frame but will also work with APS-C sensors, the lens features Sigma's latest technology for the best in image quality and edge-to-edge sharpness. Using premium FLD & SLD glass elements, the lens brings aberrations and distortion to a minimum, an issue many wide-angle lenses suffer from.